If I’m forced to burn my Chinese card at the end of this review, I will grasp onto it with white knuckles until the very last second. Because I’m about to make a statement that takes one of Chinese gastronomy’s most beloved exports, and dare say a made-for-Americans supermarket version is actually, inexplicably, palm-to-forehead-smackingly, pretty dang good. 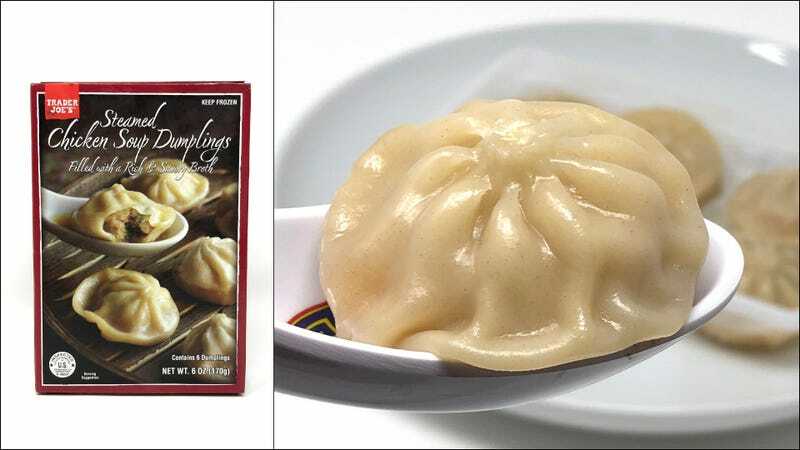 Trader Joe’s frozen xiao long bao, the Shanghainese/Taiwanese-style soup dumplings, are a B+. How?! What?! Yes, it’s true. Let’s tackle the minuses first. The dough skin, especially the pleated top-of-dumpling and the ring you grasp with chopsticks, looked pre-formed and uniform, and this gave the usually-handmade dumplings an air of artificiality. That same dough felt thicker than the thin, slack dumpling skin that emerges from most xiao long bao bamboo steamers. That burst of broth when you bite into a xiao long bao whole? It’s here. It’s rich and appealing, and there’s an adequate amount of gelatin to wash over your palate slick. Typically the filling is made from pork. The fact that it’s chicken wasn’t noticeable nor distracting. That meatball is tender and juicy, and the notes of ginger and scallions come through. From the time I removed it from the box to the time it came steaming from my microwave took two minutes. A frozen packet of six dumplings cost $2.99 at my Chicago-area Trader Joe’s. This is not Din Tai Fung. It’s not Joe’s Shanghai. It’s a quick hit to remind you of the possibilities of real xiao long bao. It’s a starter kit and a tide-me-over. It’s, shock of shocks, an honest-to-goodness decent soup dumpling from your microwave.